When I hosted my sister-in-law’s baby shower last month, I wanted the food to be simple, special, and, most of all, delicious. As I have a tendency to over-plan for events like this, I made a conscious effort to keep the menu small and uncomplicated, while still providing enough variety for my guests. In the end, I think I more than accomplished this goal; everyone left satisfied, and I didn’t have a ton of leftovers to lug home, either. These cucumbers were one of the first things I knew for sure I’d be making. They came together in no time, and everyone loved them. 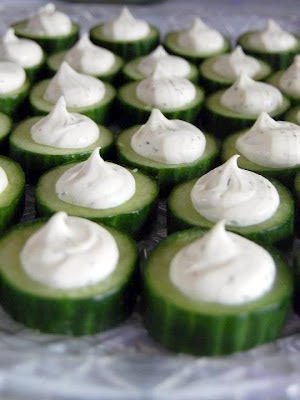 The cool, crisp cucumber is the perfect vehicle for the creamy, intensely flavorful filling. I did manage to sneak a few of them home with me, and even my kids loved them. These would be a delicious addition to your Easter table this weekend! 1. Add the cheese to a medium bowl. Add heavy cream until it reaches a spreadable consistency. Stir in fresh black pepper to taste. Place in a pastry bag or a plastic bag with the corner snipped out. 2. Slice the cucumbers into half-inch thick slices. Using a teaspoon, hollow out the center of each cucumber to remove seeds, being sure not to go all the way through the cucumber. 3. Pipe some of the filling into each hollowed-out cucumber slice. Arrange on a serving platter and refrigerate until serving. Makes about 36 medallions. These look so refreshing! Great for the Spring/Summer seasons!